Love or hate 'em, fidget toys are BIG and I'm sure I am not alone in having children who love to collect the latest design which is handy for when they are bored in the car, waiting for dinner in a restaurant or in the doctor's waiting room. Originally designed for children with additional needs fidget toys were quickly adopted by all children- and a fair few adults too! Today the latest, and I think most stylish, fidget toy is due to hit selected retailers and if my children's reaction to it is anything to go by, it's sure to prove a big hit across the UK. This simple but ingenious little gadget is MOKURU - the latest craze from Japan. The handheld wooden toy was originally designed to test an individual’s balance and focus - now this simple design is testing the dexterity of fast fingered flippers everywhere. Crafted out of beech wood into an eye catching cool design and small enough to fit in a pocket MOKURU is the go anywhere toy for all ages, a new game for kids to play in the playground, and for big kids to play in the bar, at a desk, or to be played against others in competition. MOKURU is designed to help focus and concentration, imagination and alleviate stress. I found it very relaxing to handle and flip and even the repetitive "thunk" noise is somehow soothing. Unlike fidget spinners which are a bit of a one trick toy, with this fidget stick players can refine their techniques until they become a MOKURU master. Beginners can simply tip over the toy, let it flip and catch it with their fingers or flip it to draw a triangle or square. MOKURU masters can use five MOKURU at once with one hand. Impressive! You can see from the short video (below) I shot of my 11-year-old daughter playing, that flipping and tipping MOKURU looks very simple. It's actually harder than it looks. I've been playing with it for two weeks and can only just flip it once or twice before it falls over - I'm nowhere near making the triangle or square let alone flipping several in a nonchalant fashion across my fingers which true MOKURU masters can manage. It actually didn't take my nimble fingered children too long to master the basic moves - a matter of minutes for my daughter who seems to be a natural with it. We only have one at the moment but I think it would be even more fun if we all had one and combined them for really cool moves. There's a QR code on the packaging to link you straight to YouTube tricks and tutorials videos - we think it's well worth spending some time watching to get the most out of your toy in the fastest time. So, chuck your fidget cubes and sling your spinners, MOKURU is the new black or, as the Japanese say, Genbu. The toy is also available in green (Matcha), orange, (Kirin) white (Byakko), red (Suzaku), blue (Seiryu) and yellow (Inazuma). 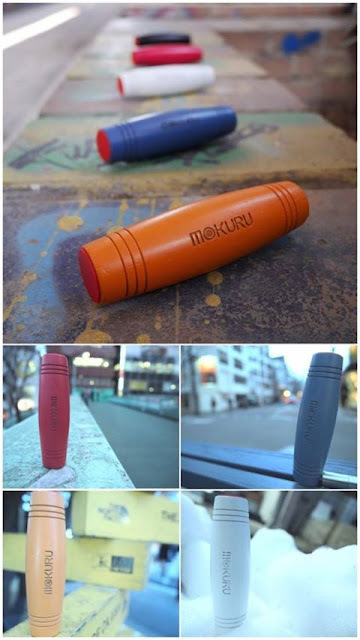 Unlike other fidget toys, MOKURU feels like a work of art- maybe because it is made of finely carved wood. We loved the weighted design - difficult to describe but very satisfying to hold and fiddle with. Designer Masakazu Node apparently worked hard to ‘create the perfect size, shape and materials’ for MOKURU. The fast flipping toy will be distributed from today (Friday July 7) in the UK and Ireland exclusively by Peterkin. It's already a big hit in Japan and Hong Kong and bound to prove popular here too, so I'd get your order in quick if you want to give your children boasting rights in the playground. MOKURU is not just for children. I think the toys would make a great gift too for any adult who enjoys executive toys - I can imagine flipping and tipping to destress during a long boring telephone call, on a train table during a dull commute or during screen breaks. Like the original fidget spinners and cubes which were copied badly and don't have the same levels of quality, perfect balance satisfaction or safety there are already fake MOKURU out there so take care to make sure you buy the real MOKURU product. You can buy MOKURU from AMAZON or SMYTHS Toys- I'll add the RRP as soon as I know it! Disclaimer: I received one free MOKURU for the purpose of this honest review.